Christmas is a wonderful time of the year, but it is also a busy time of the year! Each year the holiday season seems to creep up on me and try as I might, I never seem to catch up. Having a blog speeds things up even more...so many fun things to share, and so little time, haha! 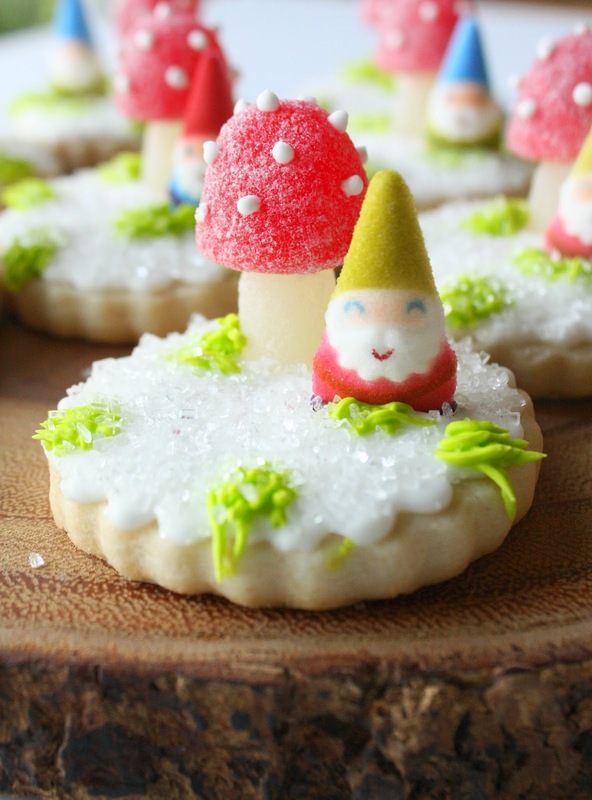 I have been smitten with whimsical toadstools and gnomes for a long time, so when my Fancy Flours catalog showed up in the mailbox, I was almost giddy when I came upon these cute, little, sugar gnomes (smiles added by me)! I knew a fun toadstool was in order and the rest, as they say, is history (excuse the dramatic flair:))! Make all the toadstools first. For each, start with a small, white gumdrop and a larger, red gumdrop. Put a little drop of royal icing on the top of the small one and the bottom of the large one. Place the large one on top of the small one and gently press together. Add the white royal icing dots with a small decorating tip. Set aside to dry. Decorating one cookie at a time, ice (they don't have to be iced "nice and neat" because they will have crystal sugar on them) the 2.5-inch round, scalloped sugar cookie. Of course you can use any round cutter of your choice, or any shape for that matter. 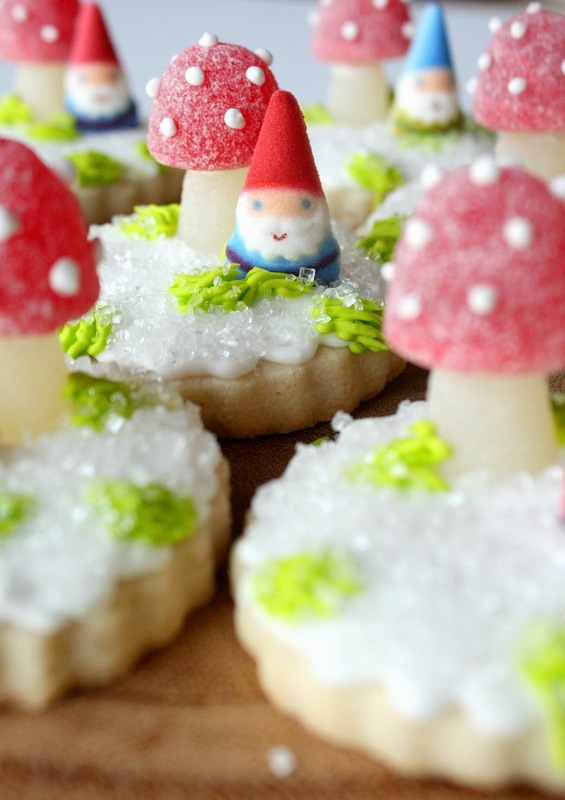 Set the toadstool and the gnome into the icing firmly, but gently. Using a grass tip (I used 233), and green tinted, thicker royal icing, add some grass in 5 or 6 random spots. Sprinkle white crystal sugar over the white icing. Set aside to dry. They turned out better than I imagined! Simple cookies are the best! I am IN LOVE with these!!!!! I must try them!!!! Do you know that I have never looked at Fancy Flours?! Oh my...my wallet may be in trouble! Merry Christmas, Sue! So completely adorable! How sweet for a woodland party! Omgosh I love these! Adorbs. Ps we are on same wavelength because I have a whimsical woodland Santa gnome treat coming soon!! 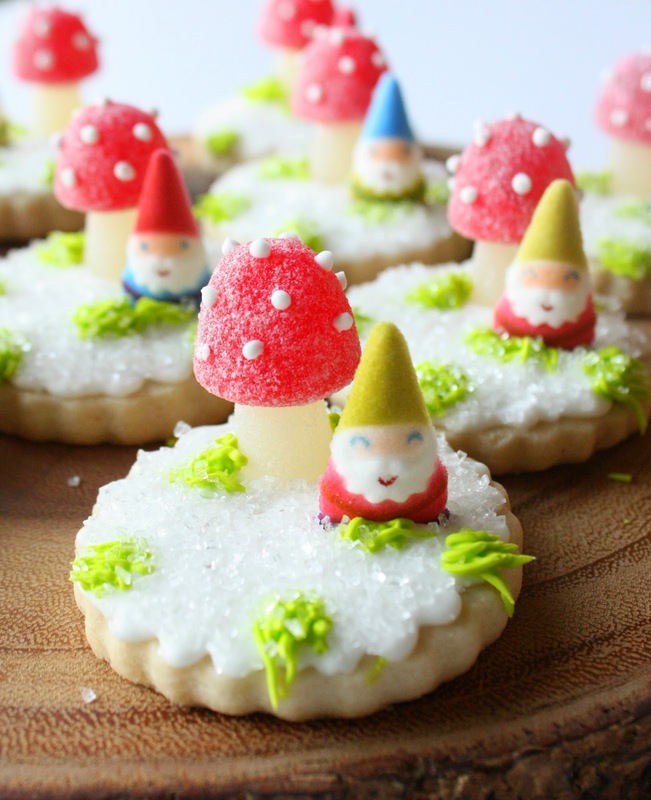 Cutest Gnome cookies EVER! Pinning now! I'm suffering from cuteness overload! Love the way you put the whole scene together ... pinned! They are so, so cute!!! Merry Christmas and Happy 2015! Hi Sue if you ever find the candy gnomes again would you mind letting me know? Thank you so much!!!! They are probably out of stock with Fancy Flours, but I will keep my eyes open, Lorraine.